Sports compression sleeves provide ankle to- calf graduated compression.Best for athletes who do not wish to change from their current running or riding socks - but still want the protection and improvement a graduated compression garment offers. Help with shin splints - leg cramping- muscle soreness with moisture wicking Light Weight 2 way stretch material. Use the Compression Sleeve in conjunction with your favorite socks to improve endurance by boosting blood circulation and delivery of oxygen to your muscles - Comfortable 2 inch top band keeps sleeve in place Super High Quality, Medical grade synthetic materials - 75% nylon and 25% spandex - Sold per pair - Latex Free -Improved Circulation and Faster Muscle Recovery: Strongest at ankle gradually decreasing up the leg we create This is not a one size fits all sleeve please see our size chart. 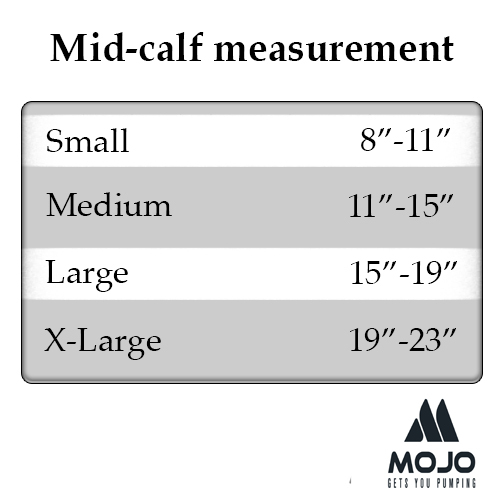 Mojo Compression Sleeves feature 20-30mmHg graduated compression. Strongest at the ankle gradually decreasing up the leg. Used by professional triathletes around the world, these are scientifically proven - to maximize power, boost energy, and speed recovery time.